Starring Broderick Crawford, Richard Conte, Marilyn Maxwell, Anne Bancroft, J. Carrol Naish, Onslow Stevens, Barry Kelley, Mike Mazurki. Definitely one of the better "underworld exposé" features of the fifties and certainly one of the hardest to see, New York Confidential retains a kick 55 years after its release. Loosely based on a book by Jack Lait and Lee Mortimer, this product of the fertile partnership of Russell Rouse and Clarence Greene (The Well, The Thief, Wicked Woman) fronts a sensational cast. The Mob has a new corporate face -- nothing comes before the interest of the organization, not even the lives of its own leaders. When New York Confidential's rights became murky in the mid- 1980s it more or less disappeared from TV screens. Kit Parker finally cleared the legal obstacles earlier this year, enabling enthusiastic screenings at Film Noir conventions in Hollywood and Palm Springs. VCI's disc release is the result of a full film and video restoration. Rouse and Greene's screenplay packs enough incident into 87 minutes to fill two Godfather movies. The Estes Kefauver hearings on organized crime raised public awareness about the workings of the Mob, which had evolved far beyond the days of gangsters with colorful names being brought to justice on tax evasion charges. The Mob, here referred to as The Syndicate, reaps in huge profits from vice and illegal gambling, and will go to any lengths to extend its influence. Head of the New York operation Charlie Lupo (Broderick Crawford) imports Chicago hit man Nick Magellan (Richard Conte) to eliminate a loose cannon among his minions, and Nick does so well that he earns a place as Charlie's bodyguard. Nick stays away from Charlie's amorous girlfriend Iris (Marilyn Maxwell). He also fends off the advances of Charlie's unhappy daughter Kathy (Anne Bancroft), who eventually runs away to live apart from her father's influence and blood money. Nick disciplines one of Charlie's troublemaking lieutenants but can't do much when the Mob's scheme to rig a shipping empire with a fraudulent government loan goes awry. A lobbyist turns against Lupo and various corrupt congressmen jump ship. A botched assassination by the incompetent Arnie (Mike Mazurki) puts federal investigators directly on the trail of Charlie Lupo, which threatens the entire organization. Everybody in the Mob knows "the rules", and not even the hulking Charlie Lupo is above them. Broderick Crawford has a field day rattling off fast dialogue, calling everybody who opposes him a "pig", and browbeating his own rebellious daughter. Charlie dismisses his best friend Ben Dagajanian (J. Carrol Naish) so the feds can't get their hands on him. Interestingly, Lupo's downfall isn't a result of hubris or ambition. The Syndicate board out-votes him on the decisions that ring down the curtain. Lupo's wife is already gone and his mother (Celia Lovsky) cannot help him; and he loses the only thing he loves, his daughter. The main theme here is the impersonal coldness of the modern Syndicate. Nick Magellan is the perfect company man, a polite, controlled, self-confident guy who looks great in a suit. Richard Conte barely raises an eyebrow as he dispatches various victims, usually in nicely blocked static master shots. The absence of "action montage" is a good thing here, as the single-angle views of Magellan's fast-draw killings with a silenced pistol exude an effortless "cool". Director Rouse gets fine performances from his actors and arranges suspenseful scenes of violence on a minimal budget. New York Confidential was released by Warner Bros., who normally didn't touch cheapo thrillers of the kind that ended up at United Artists or one of the minor distributors. The beautiful Marilyn Maxwell actually has billing above everyone's favorite Anne Bancroft. The future "Mrs. Robinson" breaks out of the doldrums of her Fox contract, eager to be given a role with some bite. Kathy Lupo is the only character with real integrity, which is not a recommended game plan in a movie of this kind. Back in the thirties and forties, the hero (corrupt or honest) might shack up with these available women, but the cold calculation of the 50s Mob requires that Nick Magellan avoid personal relationships. Charlie Lupo and Nick make no mistakes and toe the company line -- but to no avail. The necessity for the Syndicate to secure "insurance" against exposure to risk weighs far more heavily than personal relationships. Nick Magellan is a forerunner of one of Jean-Pierre Melville's French gangland assassins that behave like monks and carry out their duties like robots -- think Alain Delon in Le Samouraï. With one foot in forties noir classics (like the equally missing-in-action Cry of the City) and another in Coppola's later glamorization of the genre, Richard Conte is a noir original -- we can't take our eyes off of him. Contrary to the film's stated theme, we want the lethal Nick to prevail. 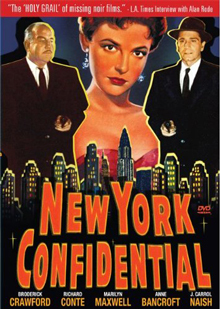 VCI's DVD of New York Confidential is an excellent enhanced transfer of a deserving film given a good restoration. Although framed a little high, giving close-ups plenty of headroom while crowding chins a bit, the image is satisfactory in all respects. The disc has been given an entertaining commentary featuring author and noir exponent Alan K. Rode and writer Kim Morgan. Besides filling us in on the film's many actors, they offer a good discussion of the film's themes. The ruthless violence is made acceptable by the moralistic framework, but Rode lets us know that there's no way the Production Code would allow Nick Magellan to shoot "safety" bullets into his victim's heads after gunning them down, as would a modern killer. Rode and Morgan also pinpoint the film's central noir dialogue statement. Nick points out that everybody's corrupt on some scale of measure. He makes the case for total materialism, saying that it doesn't matter how one gets rich as long as you succeed. Kathy says she'd rather be dead. 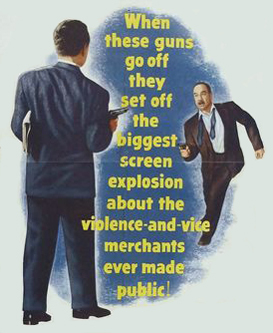 Commentator Rode doesn't say so, but he played an active role in promoting the restoration of this key 50s' noir. The disc also offers a gallery of still and lobby cards, an original trailer and a before & after restoration demo. 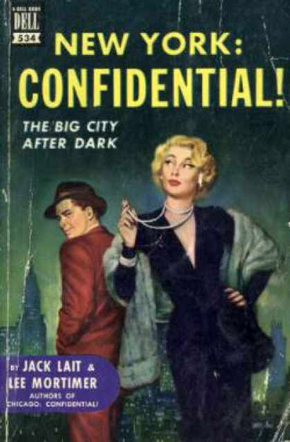 New York Confidential will appeal to noir completists and also to general crime and action fans -- its scenes of violence have a real bite, especially considering the film's vintage.